I think we need a DARK chocolate dessert for today. Something with a nice tangy surprise inside ;-) Because our guest in the "Kissing Queen" Julie Lessman. Her Daughters of Boston series took readers through a roller coast of passions and romances, but always keeping the undercurrent of the greatest passion in focus: Christ. So - Jules, out of all of your beautiful stories, who is one of your most memorable? I love Charity O’Connor, the heroine from A Passion Redeemed, because she is the vixen in book 1 whom God so wonderfully redeems in book 2. I actually had one reader say she loved A Passion Most Pure, but could I please do her a favor and slap Charity for her! Another reader said she had this overwhelming desire to see Charity “maimed or killed.” But personally, I have always loved Charity (just like I loved Scarlett O’Hara in Gone With the Wind), maybe because she is so wonderfully flawed and needy of love, not unlike I used to be before Christ. I can tell you one thing—it was SO much fun redeeming her because she is such a hoot in the later books, actually making me laugh in almost every scene she is in. Oh, and don't forget! 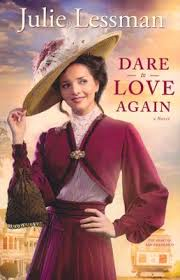 Julie's newest novel, Dare to Love Again, comes to a bookstore or e-reader near you in JANUARY!!!! I grew to love Charity (eventually!). One of my favorite scenes is when she thinks Mitch is having an affair and she barrels in to confront the woman! Love that one! No one is going to mess with Charity or her man! LOL. Charity is that essential trouble making character. Too many things go right for her….and then the story moves on and makes us love her. Good grief. Katie, is the darlin' indeed. I read the books in backwards order, seeing her fall in love and then reading what a cutie she was as a child. The discovery was quite enjoyable!